Mexican cuisine makes great use of chili and lime, so it makes perfect sense that Tajín seasoning was created by a Mexican company. For those of you not familiar with the product, it is a simple seasoning mix consisting of dried and ground red chilies, sea salt, dehydrated lime juice, and a tiny bit of an anti-caking agent. There are no artificial flavors, no artificial colorants, no sugar, and no difficult-to-pronounce ingredients. Thankfully that Mexican company has been exporting their product all over the world, so it's no longer just Mexicans who can enjoy Tajín. The Tajín product line has several products but their general use is the same across the board. First, and perhaps the most well-known product in their seasoning line is the Tajín Clásico. Then there are the low-sodium version and habanero chile mix. All three contain the same ingredients list, with the only differences being that one uses less salt and another habanero chilies instead of the combination of red peppers that the Clásico uses. When you taste any of the three your mouth puckers with a zesty and savory citrus taste, then it ends with a mild heat. So how exactly can you use this mildly spicy seasoning? It's good on almost everything, you can think of. In Mexico, locals love to sprinkle it over fresh fruits and vegetables. It adds a wonderfully fresh, citrusy, and piquant taste to the fruit that combines perfectly with the fruit's natural sweetness. As Tajín likes to say, it adds a "zing" to everything. For a summer treat it goes well over juicy slices of watermelon and mangos, crunchy bites of apples or slices of cucumbers and jicama. You can sprinkle it over any of your favorite fruits or vegetables. Use the seasoning mix in marinades or spice rubs for chicken, fish, shrimp, and even steak for a completely different flavor. For those of you that love popcorn, next time sprinkle some Tajín over the kernels—it's delicious! There really isn't much that Tajín doesn't taste great on. Theresa Chiechi / The Spruce. Additionally, Tajín can be used to coat the rims of glasses for drinks like Micheladas, Bloody Mary, Margaritas, or even non-alcoholic drinks that could benefit from a pretty glass rim decoration. Shake it over a bowl of chicken soup and you'll absolutely love the taste. 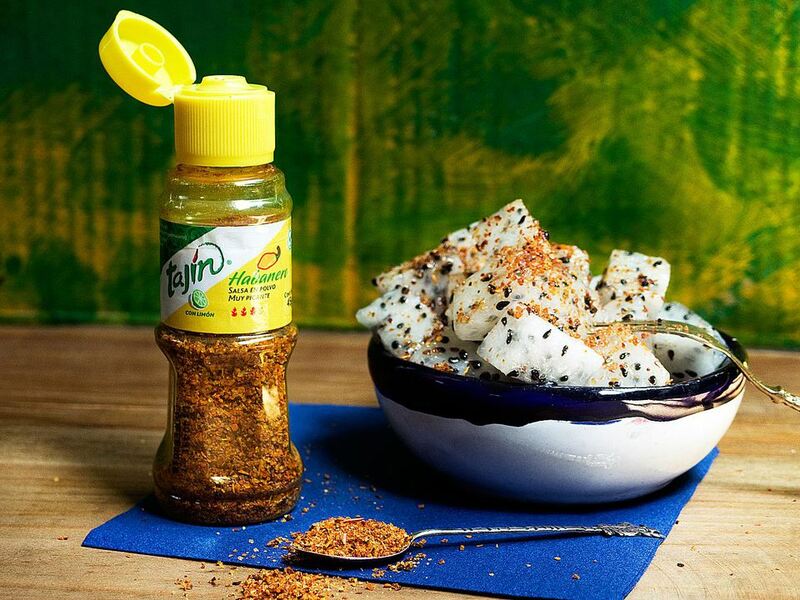 So why should you use Tajin? Simply put, it just makes so many things taste better. Remember that although it is marked as spicy, it really is still less spicy than a fresh jalapeño. Even if not everyone in your family eats spicy food, they may quite enjoy Tajín's mildly spicy heat. It's worth a try even if you don't normally enjoy spicy food.